If you are looking into getting a copier, we would love to help you. 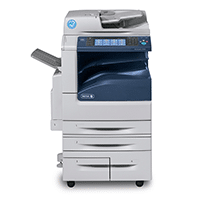 We have option for your company with both new copiers and used copiers. Right now (May 2018) there are some amazing deals from Xerox you may want to call us ASAP! Get a Xerox WorkCentre 5325 with 2 trays and a stand (black and white, 11X17 copier) for just $50 per month! Get a Xerox WorkCentre 7556 with 4 trays, fax, stapling – this one is just $95 per month. We are here to help you with your copier needs.